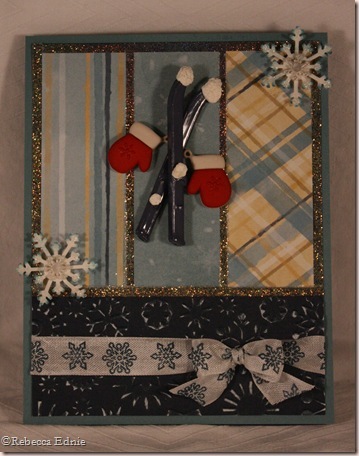 Skis and Mittens for the OCC Sketch Challenge and Whimsical Wednesdays! The OCC has another sketch challenge this week and since they are looking for Design Team members, I am making sure I am playing every sketch this month. Hey OCC gals, if you are reading this, I am a very reliable Design Team member! I take my commitments very seriously! Hope you like my cards! The Sketch: Click on the sketch to link to the OCC blog. Jessica has been on an easel card spree lately so Madelynn decided to challenge the DareDevils to make Easel cards this week. I hadn’t made one before today but seriously, they are so easy. You can see nearly everything in the photos. Basically, make a card front. 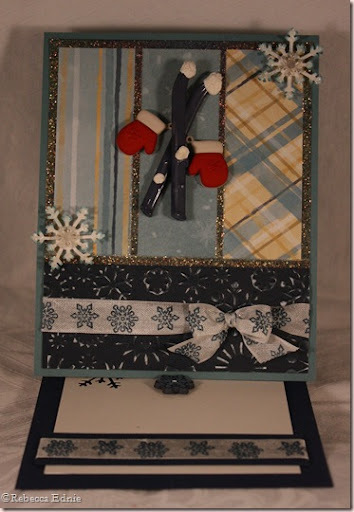 Make a top fold card base with a horizontal score line about halfway on the card front only and create a mountain fold. Adhere your card front to the card base below the score only!Make sure and add an embellishment to prop your easel up against and that is it! This shows the card opened like an easel. I added the glitter by laying down 1/8” Scor-Tape first. It is so much easier to use for straight lines than liquid glue. 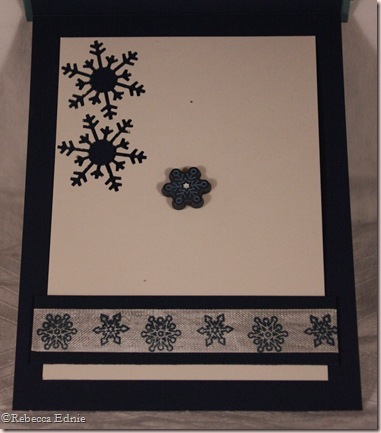 The snowflakes were accented with a bit of sponging with Distress ink to get a more 3-D look and to help them stand out. I ‘made’ the ribbon by stamping the seam tape with craft ink. The seam tape is thin enough that the snowflakes show well from the other side too. I hope you will all pay along with both challenges this week! The DareDevils DARE you to try out an easel card! You will be glad you did! I can’t wait to see your work and that of the other DareDevils! I hope you will find time to stalk their blogs! 🙂 When you make a fabulous card, be sure to link it up to Whimsical Wednesdays, use keyword DDSC11 and HAVE FUN! Ink: craft night of navy-SU! Paper: DP-CTMH, navy and juniper CS-CTMH, night of navy, shimmer white CS-SU! Oh how ADORABLE! So cute and wintery! This is so pretty. The colors look great. You did such an amazing job! This is such a cute wintery card! Those little skis are so fun! Great sketch, too!! This is truly adorable…LOVE the rich jewel tones-just a super pretty card!